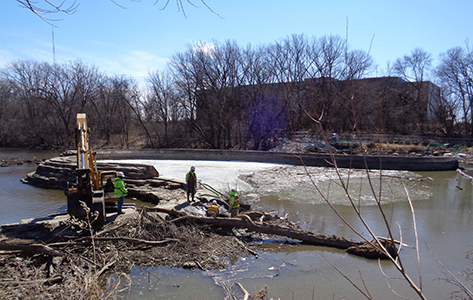 Meeting strict environmental demands, saving taxpayer money and reducing flood risk to the community; the Estabrook dam removal project is a multifaceted success for the owner, Milwaukee Metropolitan Sewerage District (MMSD), contractor, AECOM design team and the community that it serves. While the decision to remove the dam – which was constructed for recreational purposes in the 1930s – was contentious and at least a decade in the making, the end result demonstrates that environmental sensitivity and taxpayer benefits objectives that are often at odds in major engineering projects, can go hand in hand. The removal brought down the Estabrook Dam’s 200-foot-long reinforced concrete north structure; the 540-foot-long 8-foot-high serpentine-shaped south spillway; as well as the remaining 23 ice breakers located upstream of the structure. Spearheaded by MMSD, the demolition was part of the organization’s mission: Improving water quality and watercourses on the Milwaukee River and safeguarding homes from flood risk within the MMSD service area. And the improvements on the river are proving significant in restoring the health of the Milwaukee River and its marine life. Lifting the barrier dam and EPA’s project to remove the silt laden impoundment restored a flowing river habitat, making 25 river miles, 29 tributary miles, and 2,400 acres of wetland spawning and nursery habitat accessible to migratory fish such as walleye, northern pike and smallmouth bass from the Lake Michigan, the Milwaukee River and Estuary area of concern. 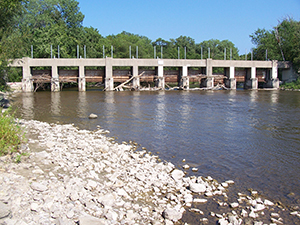 Removing the dam also benefits the mussel population in the Milwaukee River. Homeowners near the dam are also benefitting from the demolition. As constructed, the Estabrook Dam created a 103-acre water impoundment that averaged about 5 feet deep. Removing the dam reduced the flood risk of dozens of homes and indirectly reduced basement back-ups through reduced sewer system flooding. On the broader based level, the community saw positive results because the dam removal eliminated infrastructure that in its current state of repair was considered a significant potential liability for the community. All of these positive results stemmed from the collaboration between three agencies, the Wisconsin Department of Natural Resources, MMSD, and Milwaukee County and it almost didn’t happen. Originally slated as a renovation and repair project, the dam project began in 2008 when the Wisconsin Department of Natural Resources cited it for structural and nonstructural deficiencies and issued an administrative order requiring then-owner Milwaukee County to repair or remove the dam altogether. This order sparked months of contentious debate on each side of the issue but ultimately the decision was made to repair the dam with the design and permit process completed in August 2016. While this process was completed, the debate between removal and repair raged on – even as the project’s construction was put out to bid. Unfortunately for the supporters of the dam renovation, the cost of repairing the dam was significantly higher than budgeted – $4.1 million as opposed to the $3.4 million allotted. It was then that MMSD, through their Executive Director, agreed to undertake the dam removal. The dam’s ownership and immediate surroundings were transferred from Milwaukee County to MMSD. Bids to remove the dam came in at under $1 million, saving taxpayers millions over the cost of repairs. The project received several grants. Design and permitting, for example, was funded through a $250,000 grant from the Fund for Lake Michigan. The WDNR’s dam removal fund provided $50,000. An additional $2 million of funding was obtained from the EPA’s Great Lakes Restoration Initiative for repair of areas of concern in Wisconsin waterways, including the Milwaukee River. The demolition design phase was complete in 2017 and the removal was completed in 2018. Following the completed removal, the dam and surrounding land reverted to ownership by Milwaukee County. Now with the fish population rebounding, homes safely removed from the floodplain and public funds made available for other essential projects, it’s clear that the dam removal and area restoration is enhancing a public area. It’s a project that’s provided an overall winning situation and proof positive that major engineering projects do not require a choice between benefits to communities, the environment, and taxpayers. Rusty Schroedel, PE, is responsible for process design, design coordination, and project management for various projects. He has been a lead designer on major projects including design-build projects. Rusty has presented papers and has been a speaker at scores of seminars and conferences. Relevant to this project, he recalls spending time in Estabrook Park and near the dam as a child having grown up in nearby Whitefish Bay. 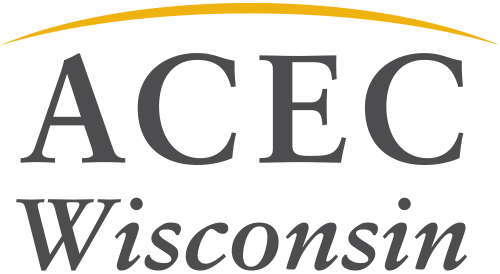 AECOM is a member firm of ACEC Wisconsin. The Estabrook Dam Removal received a 2019 Engineering Excellence State Finalist Award.